Something a bit different today, as Donald and I both offer our thoughts on the second Wink tale. Since Donald gave it a read first, we'll let him take the lead . . . 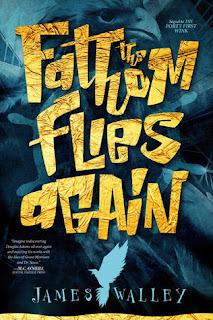 The Fathom Flies Again sticks to the high seas to live up to the first adventure from James Walley. This time a chaotic bigtop has come to a small town. Officer Michael O'Riley is on the verge of giving up, with the clowns running amok, causing unwanted drama, with giant leprechauns stomping around, and with unicorn stampedes. He finds his way on the Fathom. The Fathom's shipmates, including a new arrival - a cute little talking koala - battle in their own struggle with Peeper's army, clowns from another portal, and shadow monsters lurking the streets of the strange town that's "no stranger to sombrero wearing penguins, or the odd gorilla in a tutu." Another rip roaring adventure of laugh out loud humor. Get aboard the Fathom and fly the skies again. And now, if you'll pardon the indulgence, here are my thoughts on the latest comic fantasy adventure from Mr. Walley. As the cover blurb says, it's time to wake up and smell the carnage! Like Forty First Wink, The Fathom Flies Again was fun, imaginative, and even more over-the-top. Marty and Kate return to once again save the world from Peepers, the evil clown, this time with the assistance of a pint-sized koala who steals every scene he's in. Whereas the first book felt very much like one man's personal quest through dreamland, the stakes feel higher here. Maybe it's because we already know the characters and the concept, but the story feels fuller, and the threats more significant. That's not to say it's lost any of its madcap madness, but there's more to it that just out-loud laughs. Half of the story here is in the narration, half in the dialogue, and half in the characters. Yeah, I know that doesn't add up for us mortals, but when you're in dreamland with booze monkeys, it all makes sense. I won't say much to spoil the conclusion to this madcap adventure, but I will say this - thirty story leprechaun, baby!